Bertschi is a family owned logistics service provider, founded in 1956, with global headquarter in Dürrenäsch, Switzerland. Our gold partner’s activities include international bulk-chemical logistics, intermodal rail, short sea and road transports, global tank container transports, logistics projects and outsourcing solutions for the Chemical Industry. Our Gold Partner is leading the European Chemical Transport market with its commitment to safety, quality, service and environmental protection. Due to the systematic expansion of the company’s intermodal network and the shift of transport from road to environmentally beneficial rail and waterways, Bertschi makes a valuable contribution to environmental protection and reduction of the carbon footprint of the industry. Moreover, the activity with chemicals is performed with an extreme diligence and Bertschi is certified according to several International Standards (ISO 9001, ISO 14001, ISO 22000). With subsidiaries in the Middle East, China, Singapore, the United States and in various European countries, Russia and Turkey, Bertschi is currently present in 31 countries with more than 60 company locations. In 2012, the family company decided to go global and opened a first WFOE (wholly owned foreign enterprise) in China, after having pioneered for several years with rail transport of tank containers between China and Europe. In the same year, companies were set up in Houston (USA) and Dubai and a global network of forwarding agencies was established in over 30 countries around the globe. Based on this, Bertschi successfully started a worldwide business with tank containers for its customer base. In 2014 Singapore was opened to cover also the South East Asian Markets, and in 2015, a first major chemical logistics infrastructure – with an investment of more than US$ 30 Mio. 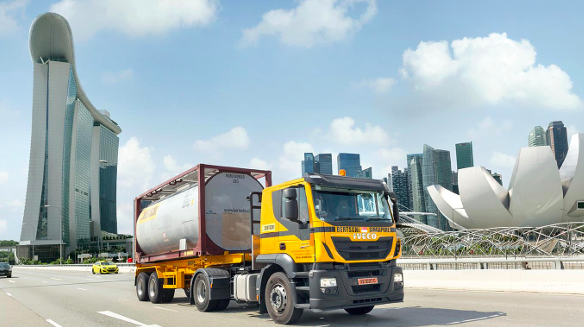 – was opened in Singapore to serve also local customers with chemical logistics outsourcing activities like warehousing and packaging of chemicals. Several projects with significant infrastructure and planed investments are also in the pipeline for the Chinese Market. Due to globalisation and digitalisation of the industry, Information Technology is becoming even more important for the future of the Bertschi Group. Therefore, our sponsor will be opening a new company location at the TECHNOPARK® in Brugg in the beginning of this year. The goals to be pursued are taking care of future solutions for the globalisation and digitalisation of the Bertschi Group business model. The TECHNOPARK® Aargau in Brugg is especially well suited due to its vicinity to the “Fachhochschule Nordwestschweiz (FHNW) “, enabling know-how transfer between research and business. Our sponsor is mostly interested in students from the fields Business Administration, International Management, Information Technology, and Business Informatics.